Android's platform fragmentation is complicated enough for users, but now more confusion looms as Google segregates the smartphone and tablet OS. While Android Honeycomb 3.0 for tablets is in the pipeline, a report from Pocket-lint suggests Google will release a mid-way version of Android for smartphones that can run some Honeycomb apps on phones. With Honeycomb, arriving first on Motorola's 10-inch Xoom tablet, Google is splitting Android into two distinct versions: one for phones and one for tablets. However, there won't be an Android 3.0 for phones this spring when Honeycomb tablets start arriving. 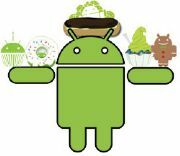 Instead, reports suggest Google will launch Android 2.4, about a month after Android 2.3 (Gingerbread), to try to bridge the gap between phones and tablets. Android Honeycomb will introduce several tablet-specific user interfaces for multipaned apps and it ends the need for hardware buttons and adds native video chatting via the Google Talk platform. Overall, Android for tablets is not very similar to Android for phones, unlike its main competitor, Apple's iOS, where the interfaces use common metaphors on both iPhones and iPads. iOS is now also universal across iPhones and iPads, meaning they have very similar feature sets, screen size and dedicated apps aside. But on Android 2.3, Google's latest version of the OS for smartphones, you don't get all the extra eye candy from Honeycomb, or the yet-to-be-designed apps for the dual core, 10-inch upcoming Android tablets. 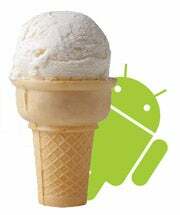 This is another leap in the fragmentation of the platform, but Google hopes to address this issue with Android 2.4, code-named Ice Cream, according to the Pocket-lint report. Android 2.4 would add the ability to support dual-core Honeycomb apps on a single-core Android smartphone. This version is rumored to arrive sometime this spring, with the first device running it slated to be the ViewSonic ViewPad, a smartphone with a 4.1-inch screen, a 5-megapixel camera and HDMI out. A previous Pocket-lint report, from a different source, indicated Android 2.4 wouldn't arrive until May or June. Most Android smartphone users are still waiting to receive the recently introduced Android 2.3 update, which, according to Google's own figures , is installed on under one percent of phones on the platform. And while they wait for Android 2.3 on their phones, and later down the line for 2.4, the first Honeycomb tablet, Xoom from Motorola, is expected to arrive later this month for a whopping $800.